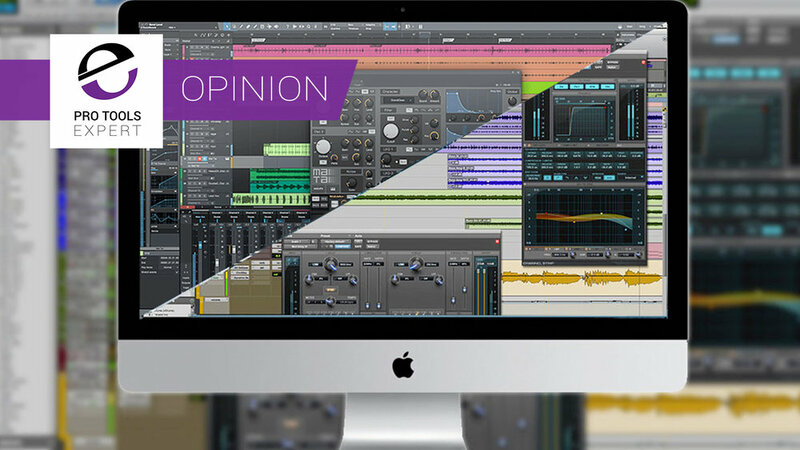 Pro Tools | From Pro Tools To Studio One - Two Years On Has Anything Changed? From Pro Tools To Studio One - Two Years On Has Anything Changed? It only seems like yesterday, but I wrote the article 'Why Is A Pro Tools Evangelist Using Studio One?' back in April 2015, and I must have been using it for longer than that to write the article in the first place. So over two years on am I still happy? Let's talk about the wins first. Without a doubt, one of the reasons I use Studio One is the speed at which I can work when creating a new song. A prime example right away is dragging and dropping to create instruments, once you've done it that way doing it any other way just seems so laborious. You might think that only makes a tiny speed difference, but when you add up all the speed improvements, it makes a huge difference over the length of a project. Workflow could be counted as speed, but it's more to do with how easy it is to do certain things. Again, for example, switching the audio interface mid-project without having to restart the entire song. The new audio engine in Studio One 3.5 is staggering, using the dual audio engine principle (not exclusive to Studio One) you can track both audio AND MORE IMPORTANTLY virtual instruments in low latency. This feature does not depend on the need for a second layer of audio monitoring software - which to date (outside of HDX) has been the way most audio interface manufacturers solve the problem. Does Studio One crash? Of course, it does, it's sophisticated software - but it crashes far less than Pro Tools, and this is the most important thing to note - ON THE SAME MACHINE. I got tired of crossing my fingers when working with Pro Tools hoping this was the session that would work for the entirety of a project. I got sick of being told it was my machine that was the problem, or that I needed a setting to be just right and to make sure I was working on a day with a full moon and with one leg in the air when booting up. Of course, there are plenty of stories of people who say 'my Pro Tools rig is rock solid and has been since 1850. Well, I was one of the many people for whom that hasn't been the case - and it was killing my workflow. I'm not anti subscriptions for software. I have several plans for things like Adobe Cloud and Frame. They, like insurance, are a modern cost of doing business. However, I want a subscription to be a reasonable price, to be optional, and offer value for money. I don't think the Avid plans do that - with Studio One I shell out my money and simply work. If I want the next version, then I upgrade, if I don't then I won't. There are plenty of other things that make me happy I use Studio One for my composition work. So what about the things I still use Pro Tools for, where does Studio One fall over and Pro Tools win? If you want to do any kind of Video work, then Pro Tools is still my weapon of choice. Granted the AVE is somewhat of a car crash, but I still find working in content from video far easier in Pro Tools. I cut the video in Final Cut Pro X and I can jump between that and Pro Tools easily using the Marquis X2Pro translator software. While a lot of work has been done to improve the audio editing workflow in Studio One, I still find editing audio in Pro Tools is a cinch and until PreSonus improve this, then I can't see myself changing. Pro Tools is still the King of audio editing, and again the reason is that I can move around audio editing tasks in Pro Tools at break neck speed without even thinking. This has nothing to do with shortcuts; this has to do with workflow - for example, when cutting a music track, I often have to move parts around or cut sections out - Studio One still offers no simple ripple editing option which is essential in a modern DAW. Can you see a pattern emerging here? Studio One does not and will not for the foreseeable future offer surround audio mixing. More and more content is being delivered in larger than stereo formats, and Pro Tools offers this option. Not that old chestnut you say - well yes. Despite Avid's numerous missteps over the last few years and the glacial speed of development in Pro Tools, which lead to the lack of many modern features required by music makers. Pro Tools remains the industry standard - like it or not. This means that if you want to work with professionals on projects then in most cases you need to be able to open and deliver Pro Tools projects - like it or not. Now you may say "simply use stems, or other audio formats" - that is possible but not preferable or flexible when a client wants to send you some work to do. Two years on, am I happy with Studio One or would I ditch it? I'm more than satisfied with Studio One - I love working with it when composing and it's my default software when I start a project. But over the two years since I wrote my original article, Pro Tools remains an essential part of my workflows. I do a lot of work with video, a lot of audio editing and many of my collaborators use Pro Tools - it is, for this reason, I continue to use it. I will say I don't love Pro Tools anymore - I tolerate it and regard Pro Tools like life insurance, which is something I need to have but hope I don't have to use if I can help it. If you work in Post then Studio One is a non-starter, it offers few of the things that are an essential part of your workflow and furthermore, Pro Tools owns the space, so trying to work in Studio One in post would be about as sensible as sending out your work on a floppy disk. So even two years on the story largely remains the same - if you want an agile and modern DAW for music creation then Studio One wins hands down, but for many tasks that pro studios and post facilities need, Pro Tools remains my weapon of choice.